If your home or business is located in Miami and you need professional floor removal services, look no further than Dustbusters Floor Removal! For decades, we have been servicing the Miami-Dade and Broward counties and surrounding areas with professional floor removal services. Whether you need industrial flooring or residential flooring removal, we have a quote that fits your budget and a timeline to suit your needs! Dust from removing flooring like ceramic or porcelain tile may not only be aggravating to clean yourself, but it can also be damaging to health. Not to mention, dust doesn’t settle for days after the flooring is removed because it can travel through air conditioning systems, so the dangers may be a threat to you and your family long after you’ve had new flooring installed. To get around the hassle and dangers of dust, we utilize a specialized system which aims to remove dust from flooring surfaces before it can be dispersed throughout the air. The technology is so advanced that even dust that cannot be seen with the naked eye is sucked up to be stored within the secured system. The end result is that projects get done faster, your flooring gets installed quicker, and you get back to using your home or business more rapidly! We don’t make it hard on you; we offer one service for one project, floor removal. Whether you have wood, linoleum, carpeting, vinyl, stone, tile, or any other type of flooring, we guarantee that our experts can provide the service you expect and need. Our flooring removal services, for all types of flooring, include a free no-obligation quote, a crew of industry professionals, top-of-the-line equipment, dumpster included within pricing, and removal of all debris. In most scenarios, we can remove an entire home’s flooring within a few hours. So, if you have a timeline to get a floor renovation project done and don’t have the time to remove flooring yourself, we’ve got your back! 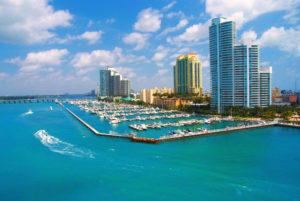 Why Choose Dustbusters for Your Miami Floor Removal Project? 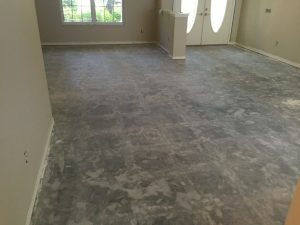 On Time: Most of the floor removal jobs we contract in the Miami area can be finished within a few hours. For larger industrial jobs, projects can be completed in just a couple days. We understand that you may have a timeline. And, we are experts at keeping to our scheduling and getting flooring removed on time so that you can stay on track with your project deadline! Dust-Free: If you’ve ever removed flooring yourself, you understand that part of the process is cleaning up once all the flooring is uprooted and disposed of. But, with a dust free system like the ones we use at Dustbusters, you won’t have to worry about the hassle of clean up! Disposal Included: All of our quotes include a disposal fee. That means for each job, we bring and utilize our own industry-standardized dumpster. Most city trash removal services won’t pick up large amounts of debris including removed home flooring. And, if you were to remove your own floor, you’d have to rent your own dumpster. But, choosing Dustbusters means that we’ll take care of the demolition AND removal of the debris! Plus, it’s all included in the price. Better Install: When you choose to have flooring removed professionally, you get expert service which leaves your floors ready for immediate install. All too often, individuals who choose to remove flooring themselves will accidentally ruin subflooring which can result in costly repairs and scheduling setbacks. Professional floor removal means being ready for install as soon as we leave! Expert Service: We pride ourselves on expert service from start to finish. This means that we will go above and beyond to not only remove your flooring quickly, safely, and expertly, but that our job isn’t done until you’re satisfied! Contact us today for a free, no-obligation quote for floor removal!